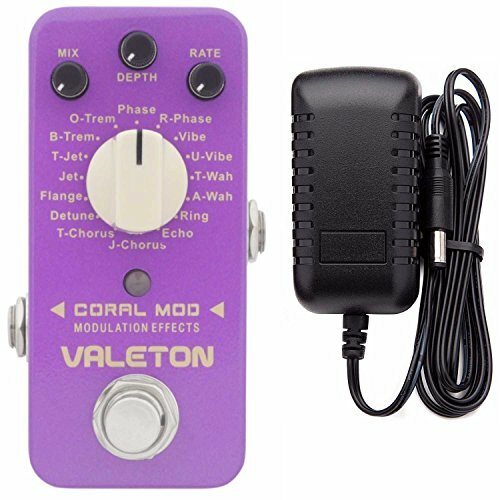 The Coral Mod Digital Modulation Effects Pedal from Valeton is a versatile accessory with settings for every music style. Valeton combined technology, original design and quality workmanship in one stompbox to house 16 carefully selected, high quality modulation algorithms. The pedal features digital circuit design, True Bypass footswitch for crystal-clear signal and delivers pristine tone with low level noise. The aluminum-alloy die cast casing is lightweight, yet rugged to withstand wear and tear, boasting easy to read, readily accessible knobs and LED on/off indicator. U-Vibe: Simulates the classic Uni-Vibe effect. SIXTEEN IN ONE: The Coral Mod Digital Modulation Effects Pedal features 16-in-1 modes making it a versatile accessory for any musical style. TRUE BYPASS: Pedal features digital circuit design, True Bypass footswitch for crystal-clear signal and delivers pristine tone with low level noise.